WASHINGTON- The second of a pair of long-delayed missile tracking satellites is packed upawaiting orders from the U.S. Missile Defense Agency (MDA) to ship out forlaunch later this year, according their Northrop Grumman builders. Thefirst of the two Space Tracking and Surveillance System (STSS) demonstrationsatellites has already been shipped to a to a payload processing facilitynear their Florida launch said, said Gabe Watson, Northrop Grumman's STSSprogram manager, in a recent interview. The satellites were slated to liftoff in August, but the flight is expected to be pushed back in light of aspace shuttle launch delay that has muddled the manifest at their spaceportin Cape Canaveral Air Force Station, Fla.
Whenthey finally blast off, the STSS satellites will be launched in a stackedconfiguration aboard a United Launch Alliance Delta 2 rocket. The MDA in Maylaunched a classified STSS demonstration satellite that was also built byNorthrop Grumman. TheSTSS satellites are designed to demonstrate the ability to trackballistic missiles in every stage of flight, something current U.S. space-basedassets cannot do. Northrop Grumman had originally built the satellites under anexperiment dubbed the Flight Demonstration System that was canceled in 1999.The program was given a new lease on life in 2002 when the MDA awarded NorthropGrumman an $868 million contract to prepare the satellites for launch. Thetotal amount spent on the program since 2002 has been $1.35 billion, and theMDA has requested another $180 million next year to conduct testing activities,according to figures provided by agency spokesperson Debra Christman. MDA'sdirector, Army Lt. Gen. Patrick O'Reilly, criticized the STSS program on May 21in testimony before a House Armed Services subcommittee, saying technical issueswith the program were responsible for more than half of the agency's $152million budget overrun in 2008. "Iam concerned with lapses in quality management involving several of ourindustry partners that have impacted system element cost, schedule andperformance," O'Reilly said. "There have been frequent schedule slipson the STSS program, some resulting in significant delays, due to qualityissues caused by lack of discipline and detail in the procedures." Inan interview, Air Force Col. Jay Morgan, MDA's STSS programdirector, defended Northrop Grumman's performance, saying it "hasbeen typical of first-article test development and commensurate with otherSpace and Missile Systems Center programs and contractors, maybe better." Watsonand Morgan declined to elaborate on the specific technical issues that wereencountered during development. "Thoseproblems are largely behind us," Watson said. "We had successfulacoustic testing in August in the stacked configuration, so we've aggressively workedthose issues and are moving toward a launch this year. It would be difficultfor me to go down that list of items. When these are on orbit, our projectionsare that all technical parameters will be satisfied." Followinga post-launch checkout phase expected to last three months, Northrop Grummanwill operate the satellites from Schriever Air Force Base, Colo., through asix-month period of testing, in which at least two dedicated ballistic missiletargets willbe launched to test STSS. The satellites also will participate in atleast two other tests of MDA systems such as the Aegis Ballistic MissileDefense system, Morgan said. The final test program is still in flux as theagency's overall test program is not yet set. Thesatellites have a staring sensor similar to that on the Air Force's DefenseSupport Program and Space Based Infrared System satellites, but they alsohave a multiband infrared tracking sensor other missile warning satelliteslack, Watson said. "Eventhough the hardware was built in the 1990s, when the two STSSdemonstrators are on orbit, they will bring a unique capability to theMDA," Watson said. "We can track missiles in every stage of flight,from launch to intercept, and do hit assessment as well. If the MDA wants tointercept missiles in the ascent phase, they will need additional data that[current missile warning satellites] don't provide." Congresshas repeatedly turned down MDA requests for funding to begin work on anoperational version of the constellation, wanting to see the results from thedemonstration satellites first. As such, the agency did not request funding tobegin that work in 2010. 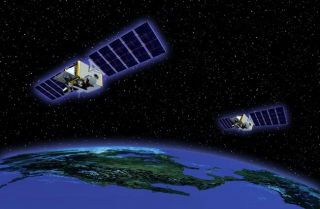 MDA Executive Director David Altwegg said in May theagency plans to request funds for 2011 if the demonstration satellitesprove their mettle. Theproposed follow-on system, dubbed the Precision Tracking and SurveillanceSystem, is in the early phases of conception, Morgan said. Decisions on thatprogram will be largely informed by the STSS demonstration's performance. WhileMDA has not ruled out making a sole-source contract award to NorthropGrumman for a follow-on system, the agency is likely to hold a competition,Morgan said. NorthropGrumman's experience building STSS would be an advantage in a potentialcompetition to build an operational missile tracking constellation, despiteconsiderations of past performance, Watson said. "Theexpertise and experience that we've gained over the past years here I believewould position us well to compete for a follow-on, if needed," he said.